You start fresh a challenge each time you step onto a tee box. But if you think the goal is to boom the ball as long as you possibly can, I would argue you’re wrong. You want to give yourself the best chance to be playing your second from a spot that is beneficial to your score AND enjoyment. It’s hard to enjoy a big drive that bounds into deep rough leaving you with no second shot. Two thoughts for you. The first: plan! Second, make sure you have a repeatable ball flight, which might mean working with your natural shot shape and not against it. There are always holes designed to punish the wayward drive. This is often a wide fairway that looks green and seductive, but narrows viciously at the Driver distance, with bunkers or worse. Too many golfers now lack confidence with their Fairway Woods, or even Hybrids off the tee. So, even when faced with great perils at the Driver distance, out comes the long club. The solution: get down to the practice tee, pull out the #5 Wood and Hybrid and hit balls off a tee. You ought to be able to land a #5 Wood or Hybrid with a much tighter shot dispersion than your Driver. The logic of the shorter shaft dictates this. And if you’re worrying about consistency, then try out the 2013 Fairways and Hybrids. You’ll find all the benefits that you have in the Driver, now built into a smaller, more forgiving head. When we are teaching golfers we are looking to find their natural swing and to make that a repeatable shot. If you have a 15 yards fade then we won’t necessarily attempt to remove it. Maybe you can play that shot every time. In which case, aim down the left and let the ball come back to the middle. 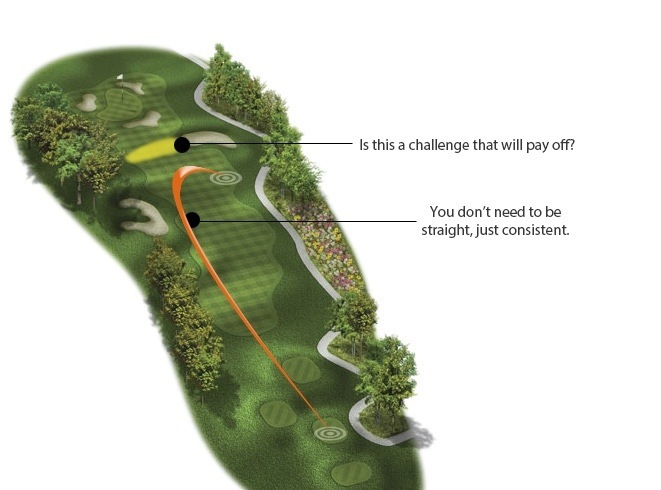 To be sure, a dogleg will present challenges, but finding a shot shape we can use on most holes that will have you set up to play an approach to the green will make golf so much more fun. We don’t want to make you into something you’re not. We work with our golfers to find improvements that translate into more fun on the golf course. This entry was posted in fitness, golf, golf instruction, golf tips, sports and tagged golf instruction, golf swing, slice, swing tips, tiger. Bookmark the permalink.